Warning this review will contain spoilers, for this show I don't care! "You went full retard, never go full retard!" The review title, is a reference of Tropic Thunder, and I think it fits perfectly in this anime, I was very undecided with the title, run Forrest run, was almost the title in honor, to the running that is performing in this anime by the main character and was the solution, to all his problems and confrontations, that and scream like a B£#$h! This review, don’t going to follow, my usual structure in a review, I only going to enumerate the problems in this anime. I tried to overcome this fact; there are lots of anime with bad animation but still very entertainment! I tried to research, why studio Zexcs, took this choice of animation, some excuses of new techniques, but was pretty bad, the eyes and mouth have free will (the rules of physics do not apply), Long distances characters loose the right of have a face, the lips synchronization was null, the hair movement, I don’t know what it looks (maybe a very bad wig!). Well it passes like all the 99% anime of Japan in a school, middle school in this case. I think after watch the anime ending, It turns around a love triangle between Saeki, Kasuga and Nakamura characters (Left to Right in title image) or about nothing at all. 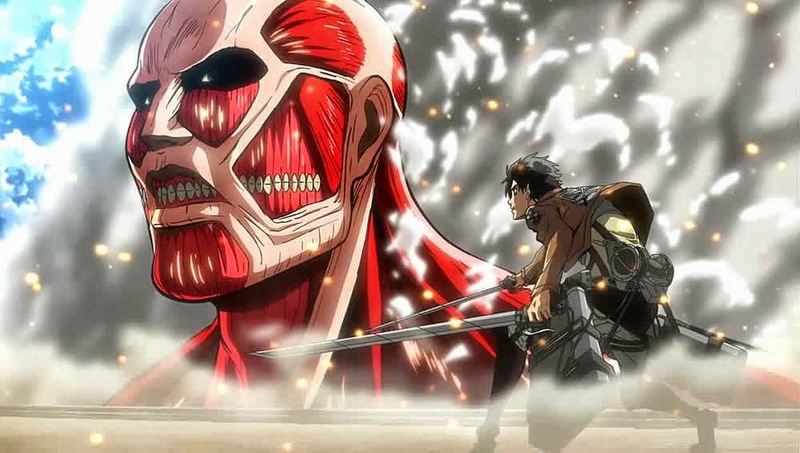 The opening for me is a very important in the animes, epic openings compensate largely (at least for me), some plot errors or paths that I don’t agree in a anime! In Aku no Hana, was a completely amateur opening, there are in YouTube betters videos ! With the “innovation” of a annoying preview in the episode opening. I mean to who unfortunately watched this, in a weekly basis and waited a whole week to know and "enjoy" a new episode, is spoiled in the opening??? In one of the episodes, I turned on my YouTube and put playing the opening of Black Lagoon and Watamote, to make this experience less terrible! 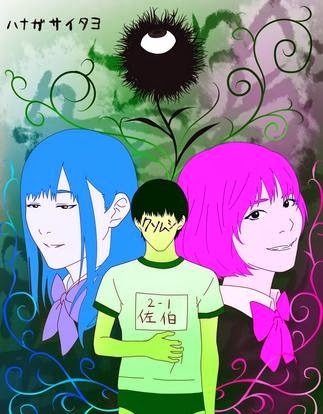 The opening artwork was simply a image and some Japanese’s writings, a complete absence of connection to the songs (yes!, in 13 episodes had several songs – another fact that I generally don’t enjoy much and in this anime, it was no exception). Well, retarded characters, it’s the right term! Kasuga resolved (or not) all their problems, running and screaming (Was this a sport anime? It make some sense in that way :P). And the eternal feeling that he thinks that is superior to everyone else, because he read Baudelaire and his book (Flowers of Evil) several times! Every Kasuga decisions are abnormal and I think I was against all of them! (One more step to distance myself of the characters) and the constant treatment of him, being treated like a pawn, was pathetic. Speaking in the book of Baudelaire – Flowers of Evil (name of the anime), What the hell, was that, It’s not the first time and will not be the last that an anime makes a plot in turn of a book, and generally gets god results (Zetsuen No Tempest this year, was pretty good (a masterpiece comparing with Aku no Hana)). Excepting, of some dream sequence, the book has a completely presence and absence in the show, at the same time. In my opinion the only thing they used of the book was the cover image and only in dream sequence or when they destroyed the classroom! To compensate the book plot there are the uniform plot. A mega crime happens in the first episode, where he steals the gym clothes of his crush (Saeki) and is get caught by Nakamura! She blackmail him, in the whole show and transforms him in his puppet, he tries to conciliate all (after some screaming and running) and fails miserably! But let me spoil one of the worst moment when Kasuga went on a date with Saeki (using their stolen uniform [by the way, it's a little weird that a girl gym uniform fits perfectly in a boy :P], by Nakamura order), he arrives to a decision, kiss Saeki or let the date end. He managed to advance to a platonic relationship, cause if he kiss Saeki is will be considered a pervert! This makes sense for anyone?? For me, didn't make, in a relationship there will be kiss and a normal interaction with the person in love, not that platonic thing! (And no one will be considered a pervert!). To maintain the pace of this anime with the absence of a visible plot or a conducting line, the ending also was one of the worst that I ever seen. After the opening spoiler, this anime presented us a new innovation, half of show, of preview of a second season (that I wish that never see the light), no conclusion of any kind (there was nothing to conclude). Reflections and more loosing notes! It was because some of anime reviewers, that generally have a similar perspective to mine that I watch this thing till the end, and has not transformed unfortunately in a dropout after the first episode. I always hope in all the bad anime that the ending, save it all, in contrast with the good ones, that the felling is invert waiting, that the end don’t screw it all. This show was so bad, that one of the most interest moment for me was when the teacher make the classroom call and one of the names was Urabe, that is the name of the main character of Mysterious Girlfriend X (curiously a anime about a love story in middle school, but well made [if you pass the drool factor]). Let's end this review, in a different way, in honor of main character Kasuga, running and screaming.